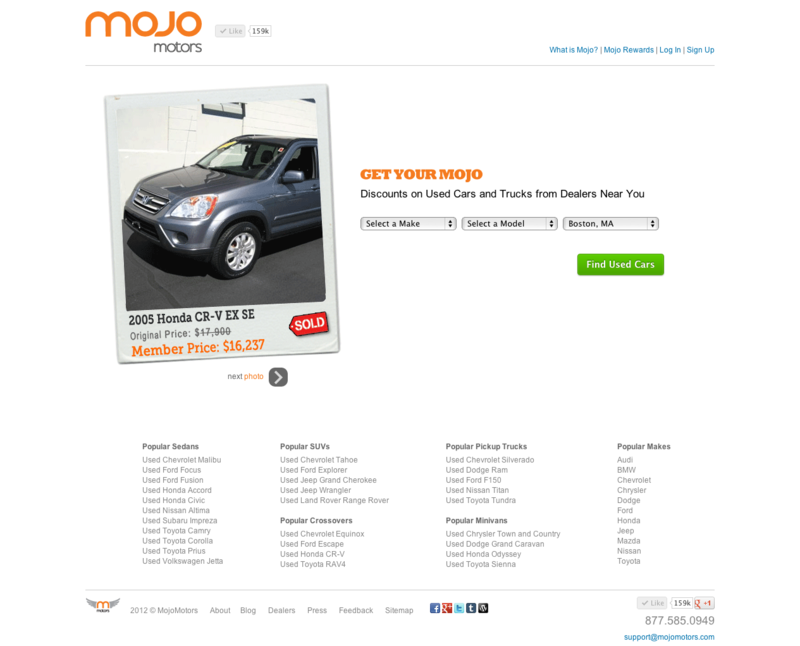 Mojo Motors, a discount shopping site for used vehicles, has raised $3 million in series A financing, led by Atlas Venture, with participation from existing investors RPM Ventures, NextView Ventures, and others. As a result of the round, Atlas Venture Partner Ryan Moore will be joining the startup’s board of directors. The round brings the startup’s total to just under $5 million. Launched in 2011 by eBay Motors and Ford Motor Company veteran Paul Nadjarian, Mojo Motors is looking to bring the process by which expert car buyers search for the best used vehicles to the average Joe. Veterans of the used car search are patient, meticulously scouring classified sites, waiting for dealers to drop prices just so, making moves once they’ve located the right deal among the noise and banner advertising endemic to online car shopping. The average person often doesn’t have the time, or the patience, to build this kind of behavior into their search, contact dealers to look for discounts, and wade through phone and email spam that results from each contact, rinsing and repeating for each car of interest. So, Mojo Motors automates the expert buyer’s process, allowing users to search for used cars, and by joining as a member, view discount prices and receive personalized alerts from Mojo, not the dealer, when relevant cars drop in price or are sold. Mojo users can print discount vouchers and visit dealers for test drives when the price is right. While TrueCar and CarWoo, for example, have made the process of buying new cars less of a hassle, the Mojo CEO says that the used car market is both larger in size, and in the challenges it presents. The search for used cars is inherently more time consuming, as each car is unique, making comparison shopping much trickier, and used cars, for dealers, are depreciating assets, setting high prices to begin with and randomly reducing the price over time as the car sits on the lot. Mojo’s big value prop, then, is those alerts, which let you know when a dealer drops a price on a car you’re interested in. With nearly 40 million used cars sold per year, the market is sizable, and sites like AutoTrader and Cars.com already have big user bases and, with over $1.5 billion in revenue combined, considerable advertising budgets. But the Mojo founder says that these sites remain equivalent to online classifieds and have largely failed to evolve the used car search process. In comparison, Mojo allows users to maintain privacy and control over the search process, while receiving personalized alerts on deals and sales in their locale. Users only contact dealers once they’re ready to test drive, avoiding spam and hassle, while presumably getting a better deal. As to how Mojo is monetizing? Both shoppers and auto dealers join the site for free, but the startup charges dealers a $350 success fee when a member actually purchases a car from their lot. The startup has been in beta, focusing on its home market of Boston, but plans to use its latest infusion of capital to expand into a slew of major markets over the course of the year, as well as ramp up its hiring and marketing efforts. For more on Mojo Motors, check it out home here.